Let that be a lesson t'ye! 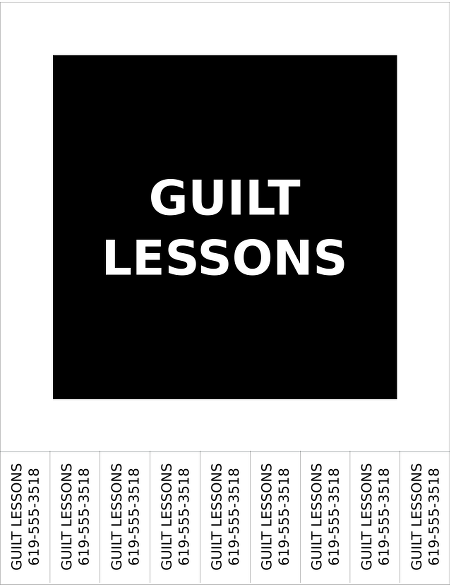 Of course, I wouldn't expect guilt lessons to be seriously and openly advertised (though some college courses seem indeed to be guilt lessons). Rather, I had thought that the advertisement were a joke or a work of art. I suppose now that this were a matter of illusory found art. Off-and-on, I work on the plans for a couple of pieces of serial fiction. And thus it is repeatedly brought to my attention that, for the stories really to work, a profound necessity must drive events; essential elements must be predestined and meaningful. This characterization contrasts markèdly from my view of real life. I think that people may be said to have personal destinies , but that these can be unreälized, as when we say that someone were meant to do or become something, but instead did or became something else. And, if I did believe that the world were a vast piece of clockwork, then I'd be especially disinclined to think that its dial had anything important to say. There's a sort of story-telling that has not yet, to my knowledge, really come into existence, though it has been possible for many years. It has been approached from multiple directions; and, if it emerges in no other way, then it will emerge from computer gaming, when AI in personal information technology becomes sufficiently powerful. However, it doesn't actually require AI at all. An example of the experience of such a game without AI is easily imagined. The user launches the program. There is no prologue. He or she finds himself just inside the gate of a property, with various things in his or her possession. Leaving the property in any way exits the program. Proceeding into the property gets one to things such as one or more buildings. The buildings have things such as desks; the desks have drawers. The drawers have contents. Examing these contents and other things on the property, the user perhaps learns things. Reflections may or may not be revelatory, depending upon the stories. There are no declarations of achievements; one is never told when all the important pieces have been seen. But stories are there and some people find them. There will be writers who learn how to move the user to joy or to fear or to sorrow or to melancholy in this way. AI can be introduced first for beasts — birds, rodents, perhaps cats. It will be a while before a proper dog can be implemented. (And I'm not so sure about a cat.) Other persons probably first begin as those at the other ends of telephone lines. Some of you may already be familiar with Molly Kiely, an artist best known for illustrations in an alternative comic-book style. She and Ginger Mayerson are currently seeking funds to complete a graphic novel, Eschaton-a-Go-Go . Appropriately enough, they have a campaign on IndieGoGo. 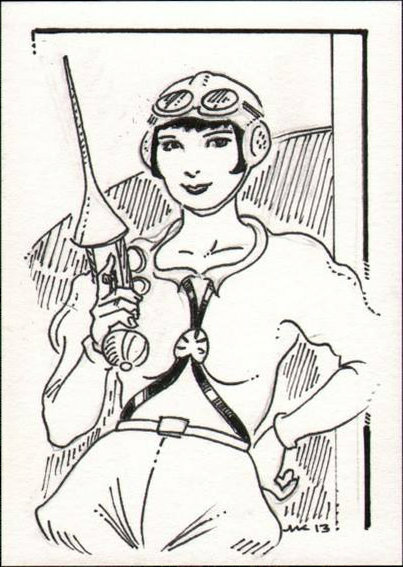 her take on Wilma Deering, roughly as Wilma appeared in the 1929 episodes of the Buck Rogers comic strip. Now, here's your problem: This offer was limited to 25 ATCs; when last I knew, 7 of them were already claimed. That leaves just 18 still available. You don't want to suddenly realize that you'd like an ATC of LN-18 or of Alice White or of Galloway Gallagher or of Gene Tierney, only to discover that the last of these commissions went to some clown who wanted a picture of Professor Simon Wright. I collided yester-day with Brouwer's Fixed-Point Theorem while writing a program that aids artists in creating on-line web galleries. There's a notion in art of complementary color. The lighter a color is, the darker is its complement, and v.v.. And, if one locates a color on a color wheel, this complement is its diametrical opposite on the wheel. Complementary colors are used, well, to complement things. So, for example, a dark red object is thought to look best against a light green background (if one uses the classic red-yellow-blue color system) or against a light turquoise background (if one uses the red-green-blue system). I thought (and think) that it would be a fine thing if an image should be automatically displayed on a page whose background color were the complement of the average color of the image. In keeping with this complementarity, it might seem to be a good idea for the page text to be the complement of the background, which is to say that original average color. Well, here is where Brouwer pokes his head in the room and suggests a problem. Brouwer's Fixed-Point Theorem tells us that every continuous function f from a closed ball onto itself has a point x such that f(x) = x. A color wheel is a closed ball in two dimensions. Grey-scale is a closed ball in one dimension. Half-way between black and white is a shade of grey which is its own complement. The color dead-center on a color wheel is its own complement. So the center of the cylinder formed by the Cartesian product of light-and-dark with the color wheel is its own complement. And any colors near this center have their complements also near this center, which means that there isn't enough contrast for real usability. Color schemes such as medium grey text on a medium grey background just don't cut it. I recently acquired a copy of this image as a page removed from an issue of Theater Magazine . I'm not sure that I would have got it had I known that it came thence; I'm not comfortable the practice of dismembering old books and magazines for their images, except in cases where there is truly negligible interest in the volume or issue in question being held together. In any case, I think it a very nice picture. Ask my pen; it governs me,—I govern not it. 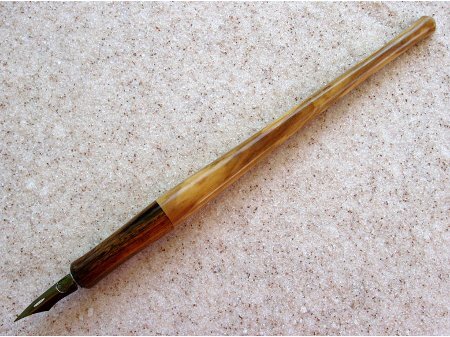 As I was looking for a holder for the Esterbrook Nº 356 nibs that I got, I ran across dip pens being produced by Steven P. Engen of Cottonwood, AZ. 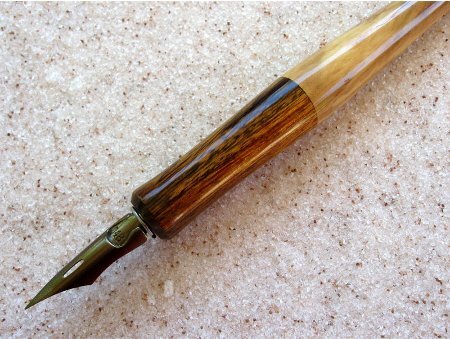 While these could hold a Nº 356 nib, they're not particularly well suited for that particular purpose. Images copyright © by DipPens.net; used with kind permission thereof. Honestly, I'm not sure how much I'll use them for writing (now-a-days, my every-day pen is a Lamy cp 1 black fountain pen), but I figured that I'd later think back with regret if I failed to get these two pens. Having read that the Esterbrook Nº 356 was Carl Barks' pen nib of choice for inking his work, I got some to try. The Esterbrook Steel Pen Mfg. Co. itself has essentially been gone for decades, so one looks for NOS ; the nibs that I got are ostensibly from the 1940s. 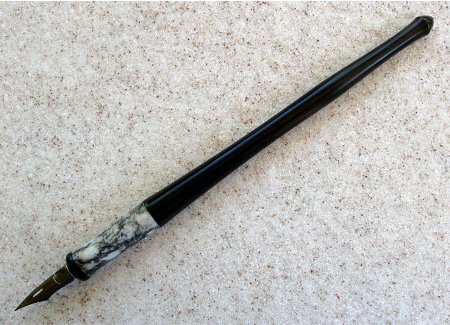 Having got nibs, I wanted an Esterbrook Nº 35 holder for them. Again, it would be some decades old. I found one in a set with 12 nibs of varying size. Well, it arrived on Friday, with the paper seal still intact on the box. I cannot open the box without committing some crime against antiquarian preservation! I am defeated. 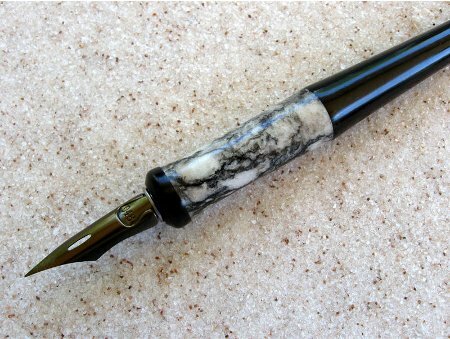 I will look for another holder for my nibs.